John Bartram (1699-1777), With the aid of Benjamin Franklin started on an 8-acre plot on the west bank of the Schuylkill, about 3 miles (5 km) from the center of Philadelphia, the Kingsess Botanic Garden in 1727. 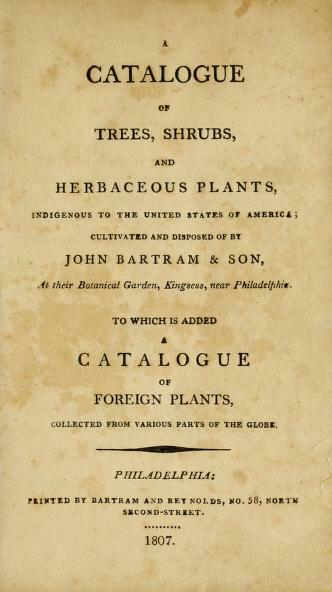 Bartram's Garden in Kingsessing, Pennsylvania is frequently cited as the first true botanic collection in North America. As one of the very earliest nurseries in the American Colonies it shipped plants to Linneaus and other botanists. It was carried on by his sons. See page 19 for domestic Irises and page 32 for Exotics.